The aim of this study was to compare corneal hysteresis (CH) in normal and keratoconic corneas in high cylindrical astigmatism (≥3 D). There is a great interest in corneal biomechanics as it aids in the study of corneal viscoelasticity. The ocular response analyzer (ORA) measures the corneal biomechanics through the analysis of the corneal dynamic behavior when it is deformed by an air puff. Studies using ORA in the evaluation of corneal biomechanics revealed a significant difference between keratoconic and healthy corneas. This study included 22 normal and 24 keratoconic eyes, which were diagnosed by means of clinical examination and corneal pentacam topography. CH and corneal resistant factor were measured using ORA. The mean CH was found to be 10.92 ± 1.7 mmHg in normal individuals, whereas in keratoconic patients it was 7.7 ± 1.29 mmHg. However, the corneal resistance factor (CRF) was 11.077 ± 1.96 mmHg in normal individuals compared with 6.3 ± 1.59 mmHg in keratoconic patients. The difference between the normal and affected groups was statistically significant in both CH and CRF (P < 0.0001, independent sample t-test). A strong direct correlation of central corneal thickness (CCT) with CH and CRF was found. The correlation coefficients (r) were 0.729 and 0.793 with CH and CRF, respectively. 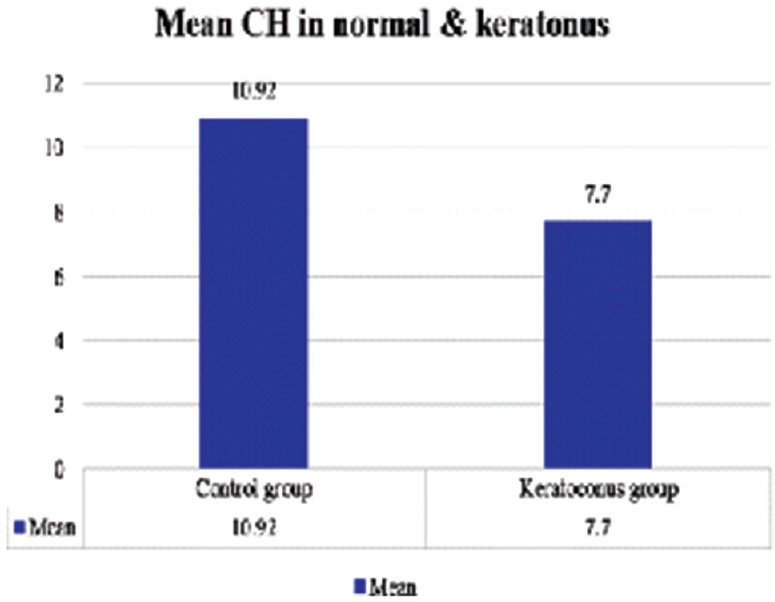 CH and CRF were significantly higher in normal eyes than in keratoconic eyes. The correlation of CCT with CH and CRF when assessing the corneal biomechanics showed that lower CH and CRF implies a significantly reduced viscoelastic response in keratoconus than in normal eyes. Thus, this weakness in corneal viscoelasticity is associated with the lower CCT identified in keratoconus eyes. The cornea is a viscoelastic tissue partially built from collagen fibers, elastin, and ground substance, which provide strength, elasticity, and viscosity, respectively. The dynamic bidirectional applanation process used in the Reichert ocular response analyzer (ORA) provides a new measure of corneal biomechanics called corneal hysteresis (CH) . Recently, there is a great interest in corneal biomechanics, which aids in the study of corneal response to the surgical or therapeutic interventions,,. Moreover, it helps to obtain accurate intraocular pressure (IOP) measurements in keratoconus, post-Lasik, and glaucomatous patients. Corneal biomechanics and central corneal thickness (CCT) have a great influence on the IOP measurements and may also be indicative for ocular globe biomechanics that could also be predictive of glaucoma susceptibility . Two devices are available for the assessment of corneal biomechanics: ORA and Corneal Visualization Scheimpflug Technology . ORA analyzes the dynamic behavior of the cornea when it is deformed by air puff, which showed a significant difference between keratoconic and healthy corneas. Although there are two commercially available clinical tools for assessing corneal biomechanical properties in vivo, no instrument can be solely used to reliably diagnose keratoconus. Further research studies will improve the diagnostic efficiency of these instruments . Studies on and on reported that CH and corneal resistance factor (CRF) are decreased in keratoconus than in normal and post-Lasik corneas . Lower CH and CRF are correlated with higher grades of keratoconus, and the difference between CH and CRF (CH–CRF) is more positive as disease severity progresses . The purpose of this study was to evaluate the performance of ORA in the differentiation of corneal behavior in both keratoconic and normal corneas in high cylindrical astigmatism, and to study the effect of CCT (measured with Oculus Pentacam) on corneal biomechanics. The study protocol was approved by the ethical-committee of Menoufia university. A written consent was obtained from each participant. All of the included cases were informed the purpose of the study, and informed consent was obtained. A clinical prospective comparative study was conducted on 34 patients (46 eyes) who were classified into two groups: the control group and the keratoconus-diseased group. The control group included 17 patients with 22 normal eyes (group I) and the keratoconus-diseased group included 17 patients with 24 diseased eyes (group II). Patients' ages in group I ranged from 18 to 46 years with a mean age of 26.8 ± 9.02 years. There were six male (seven eyes) and 11 female (15 eyes) patients. Group II included 24 eyes of 17 patients; their ages ranged from 18 to 48 years with a mean age of 29.04 ± 9.41 years. The keratoconus group contained 10 male (15 eyes) and seven female (nine eyes) patients. Inclusion criteria were as follows: age more than or equal to 18 years, corneal astigmatism ≥3 D, and clear cornea. Exclusion criteria were corneal astigmatism less than 3 D, evidence of corneal opacity, and history of previous corneal surgery. Baseline examination included visual acuity, slit lamp examination, full ocular examination, and medical history. CH and corneal resistant factor were measured using ORA (2010; Reichert Ophthalmic Instruments, Depew, New York, USA). However, CCT and corneal astigmatism were assessed using Oculus Pentacam HR topography (Arlington, WA, USA). Statistical analyses displayed in the present study were conducted using SPSS version 22 (SPSS Inc., Chicago, Illinois, USA). Each of the studied parameters (CH, CRF, and CCT) was described in the two groups (the normal and keratoconus groups) considering the upper and the lower limits, mean values, and SD. The mean values of the two groups were compared in the prementioned parameters using the independent sample t-test. The strength of the relations between the measured parameters was evaluated using Pearson's correlation coefficient (R) as well as determination coefficient (R2). A P value greater than 0.05 was considered statistically nonsignificant. A P value less than 0.05 was considered statistically significant. A P value less than 0.001 was considered statistically highly significant. The 46 eyes were classified into two groups: the control group and the keratoconus-diseased group. The control group (the normal group) included 22 eyes of 17 patients (group I). There were six male (seven eyes) and 11 female patients (15 eyes). Their ages ranged from 18 to 46 years. The keratoconus-diseased group included 24 eyes of 17 patients (group II). There were 10 male (15 eyes) and seven female patients (nine eyes). Their ages ranged between 18 and 48 years. The obtained measurements were statistically analyzed using SPSS (version 22) to evaluate the relations between the mentioned parameters. The analyses are shown and interpreted in the following paragraphs. The comparison between mean CH [Table 1] in the normal group (group I) and the keratoconus group (group II) shows that the mean CH was 10.92 ± 1.70, with a minimum of 8.2 and a maximum of 15.8. However, the mean CH in group II was 7.7 ± 1.29, with a minimum of 4.90 and a maximum of 9.6 [Figure 1]. The statistical difference between the two groups was significant (P < 0.0001). Figure 1: Comparison of mean corneal hysteresis in the control group (corneal astigmatism ≥3) and the keratoconus group. CH, corneal hysteresis. The comparison of mean corneal resistant factor [Table 2] between the normal group and the keratoconus group [Table 1] showed that the mean corneal resistant factor in the normal group was 11.1 ± 1.96, with a minimum of 8.2 and a maximum of 15.8. The mean CRF in the keratoconus group was 6.3 ± 1.59, with a minimum of 2.8 and a maximum of 9.3 [Figure 2]. The statistical difference between the two groups was significant (P < 0.0001). Figure 2: Comparison of the mean corneal resistance factor in the control group (corneal astigmatism ≥3) and the keratoconus group. CRF, corneal resistance factor. The interactive relations between the measured parameters were studied by measuring the relation strength using Pearson's correlation coefficient. [Table 3] shows the correlation matrix of the studied parameters. The Pearson correlation coefficient was calculated considering the 46 studied eyes. The following paragraphs summarized the effect of age and CCT on CH and CRF. The correlation of CH and CRF with age [Table 4] demonstrated a weak negative relation [Figure 3] and [Figure 4]. The correlation coefficients (R) were -0.192 and -0.077 with CH and CRF, respectively. The R2 was 0.037 for CH and 0.006 for CRF. Figure 3: The correlation of corneal hystresis with age. CH, corneal hysteresis. 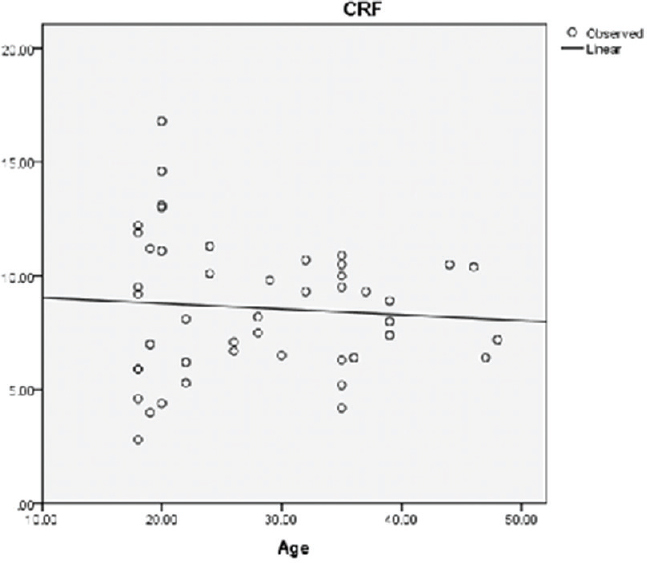 Figure 4: The correlation of corneal resistance factor with age. CRF, corneal resistance factor. The correlation of CH and CRF with the CCT [Table 5] demonstrated a highly significant strong direct relation [Figure 5] and [Figure 6]. Thus, CH and CRF increase with an increase in CCT. 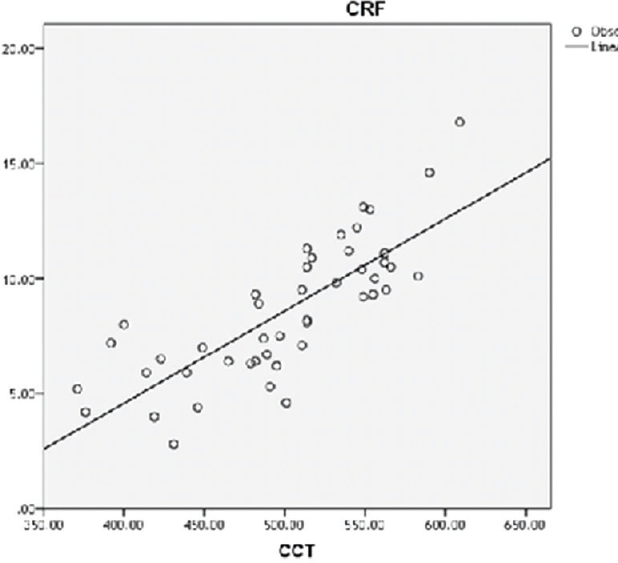 The correlation coefficients (R) were 0.729 and 0.793 for CH and CRF, respectively. The R2 was 0.532 for CH and 0.629 for CRF. In other words, the CCT is responsible by 53.2 and 62.9% for the changes in CH and CRF, respectively [Figure 7] and [Figure 8] and [Table 6]. Figure 5: The effect of central corneal thickness on corneal hysteresis. CCT, central corneal thickness; CH, corneal hysteresis. Figure 6: The effect of central corneal thickness on corneal resistance factor. CCT, central corneal thickness; CRF, corneal resistance factor. Figure 7: The effect of corneal astigmatism on corneal hysteresis. CH, corneal hysteresis. 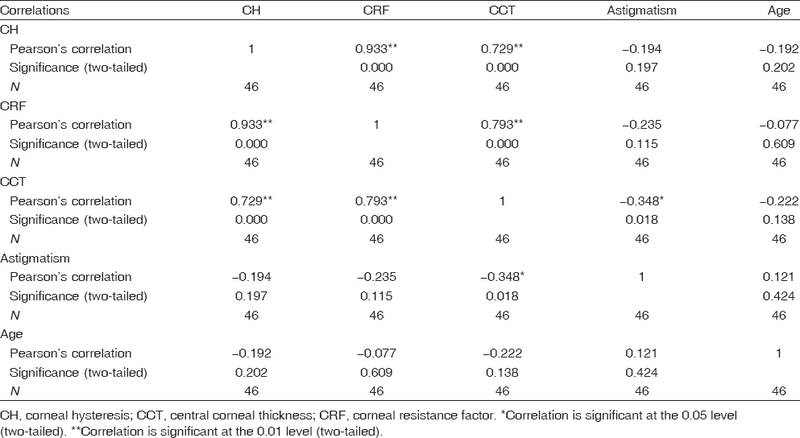 Figure 8: The effect of corneal astigmatism on corneal resistance factor. CRF, corneal resistance factor. Early detection of keratoconus remains a clinical challenge. Changes in the biomechanical properties of keratoconic corneas are anticipated to occur before the disease becomes detected using pentacam topography, and hence the early detection of keratoconus is very important as keratoconus is the most common indication of keratoplasty ,. Reichert ORA has been used as an in-vivo method of measuring of the corneal biomechanical properties. It also measures the central corneal response to indentation with an air puff and provides two metrics of the corneal biomechanics, CH, and the corneal response factor (CRF) . This study discusses the impacts of keratoconus on the biomechanical properties of the cornea. This study compared the biomechanical properties of normal corneas with keratoconic corneas and found that there was a significant decrease in corneal biomechanical properties (CH and CRF) in the keratoconus group compared with the control group. This is in agreement with other studies in the same topic. For example, Shah et al. revealed that the mean CH was 9.6 ± 2.2 mmHg in keratoconic eyes compared with 10.7 ± 2.0 mmHg in normal patients. Ortiz et al. found that the mean CH and CRF were 7.5 ± 1.2 and 6.2 ± 1.9 mmHg in keratoconic eyes compared with 10.8 ± 1.5 and 11.0 ± 1.6 mmHg in normal eyes, respectively. Mollan et al. found that the mean CH and CRF were 8.7 ± 2.2 and 6.9 ± 2.4 mmHg in keratoconic eyes compared with 10.6 ± 2.2 and 10.0 ± 2.5 mmHg in normal eyes, respectively. Tuoboul et al. found that the mean CH and CRF were 8.3 and 7.6 mmHg in keratoconic eyes compared with 10.3 and 11.0 mmHg in normal eyes, respectively. Saad et al. found that the mean CH and CRF were 8.1 ± 1.4 and 7.1 ± 1.6 mmHg in keratoconic eyes compared with 10.6 ± 1.4 and 10.6 ± 1.6 mmHg in normal eyes, respectively. Liu et al. found that the mean CH and CRF were 7.1 ± 1.6 and 6.3 ± 1.5 mmHg in keratoconic eyes compared with 10.1 ± 1.3 and 10.5 ± 1.6 mmHg in normal eyes, respectively. There was a statistically significant difference between the two groups (P < 0.0001). 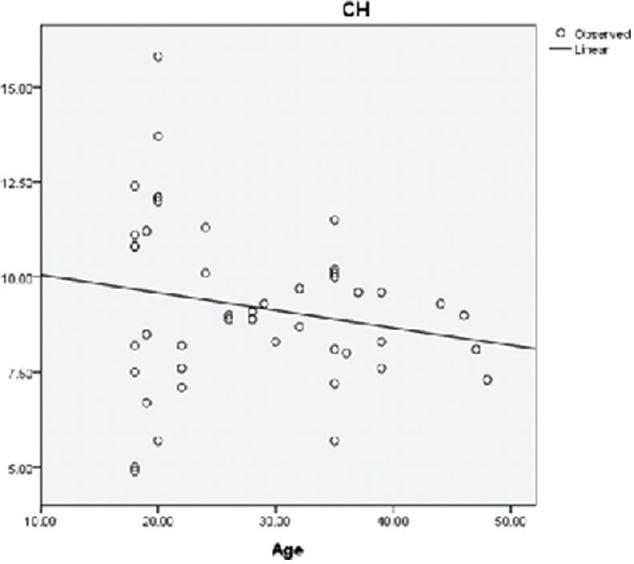 The correlation of age with CH and CRF demonstrated a weak negative relation, and hence CH and CRF slightly decrease with age. Lower CH and CRF reflect a reduced viscoelastic response in keratoconic corneas. In addition, we investigated whether this decrease in corneal viscoelasticity is associated with the thin corneas identified in keratoconus. Shah et al. 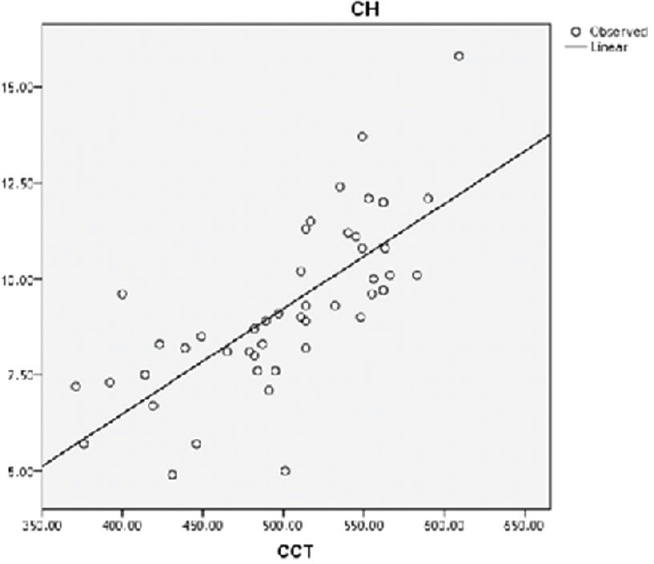 measured the average CH and CRF and correlated it with CCT in normal corneas. They revealed that CH and CRF increased with the increase in CCT. The mean hysteresis was 10.7 ± 2 mmHg, the mean CRF was 10.3 ± 2 mmHg, and the mean CCT was 545 ± 36.4 μm; the correlation was moderate . In our study, we studied CH and CRF in both normal and keratoconic eyes and correlated them with CCT in all patients; we revealed a highly significant positive strong correlation with CCT. This means that CH and CRF increased with the increase in CCT. In keratoconic patients, there is decreased CCT (mean = 455.7 ± 43.6), and hence there is a decrease in the mean CH (7.7 ± 1.3 mmHg) and CRF (6.3 ± 1.6 mmHg), in comparison with CCT in normal individuals (mean = 548.5 ± 26); thus, there is an increase in mean CH (10.92 ± 1.6 mmHg) and CRF (11.1 ± 1 mmHg). In other words, we found that the CCT is responsible by 53.2% (R2 = 0.532) and 62.9% (R2 = 0.629) for the changes in CH and CRF, respectively. 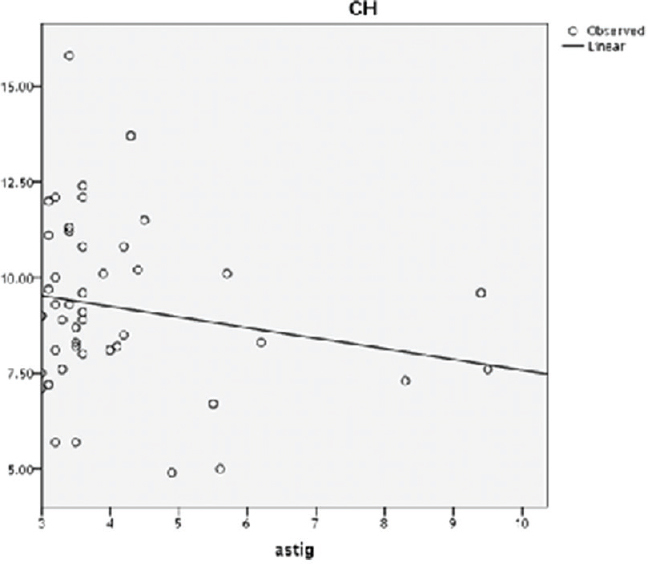 Correlation of corneal astigmatism with CH and CRF demonstrated an inverse very weak relation. 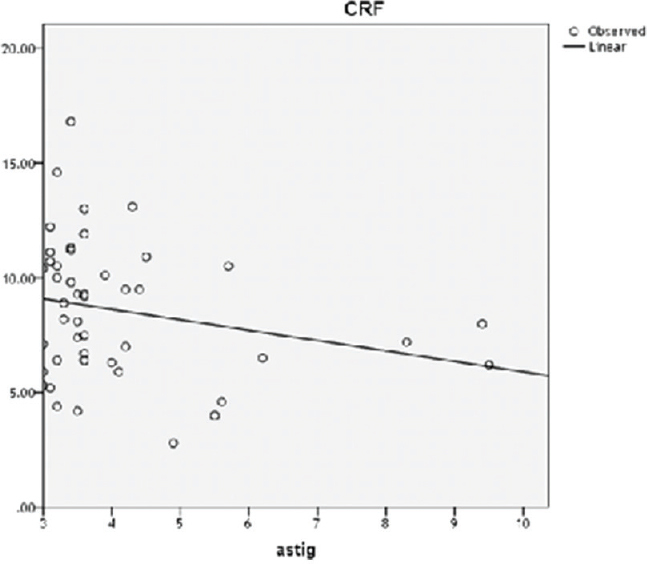 The correlation coefficients (R) were -0.194 and -0.235 for CH and CRF, respectively. The R2 was 0.038 for CH and 0.055 for CRF. 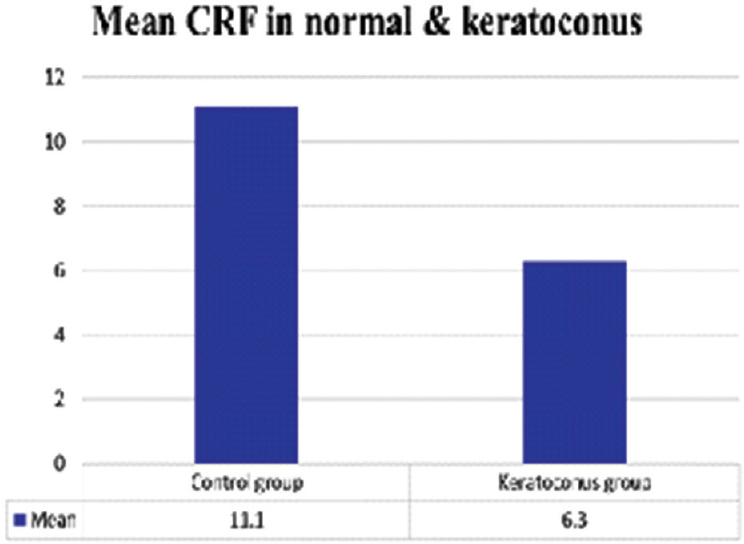 The CH and CRF are significantly lower in keratoconic corneas than in normal corneas. This reflects decreased corneal viscoelasticity and ocular rigidity in keratoconus eyes than in normal eyes. The correlation of CCT with CH and CRF expressed a strong direct relation (0.729 and 0.793 mmHg, respectively), and hence CH and CRF are directly affected with the change in the CCT. In keratoconic corneas, CCT is significantly lower than that in normal corneas; thus, there was decreased CH and CRF, which reflects a decrease in the conceal viscoelastic response. There was a weak inverse relation between age and both CH and CRF (-0.192 and -0.077 mmHg, respectively). Luce DA. Determining in vivo biomechanical properties of the cornea with an Ocular Response Analyzer. J Cataract Refract Surg 2005; 31:156–162. Ortiz D, Piñero D, Shabayek MH, Arnalich-Montiel F, Alió JL. Corneal biomechanical properties in normal, post-laser in situ keratomileusis, and keratoconic eyes. J Cataract Refract Surg 2007; 33:1371–1375. González-MIijome JM, Queirós A, Jorge J, Díaz-Rey A, Parafita MA. Intraoffice variability of corneal biomechanical parameters and intraocular pressure (IOP). Optom Vis Sci 2008; 85:457–462. Kirwan C, O'Keefe M. Corneal hysteresis using the Reichert ocular response analyser: findings pre- and post-LASIK and LASEK. Acta Ophthalmol (Copenh) 2008; 86:215–218. Grise-Dulac A, Saad A, Abitbol O, Febbraro JL, Azan E, Moulin-Tyrode C, Gatinel D. Assessment of corneal biomechanical properties in normal tension glaucoma and comparison with open-angle glaucoma, ocular hypertension, and normal eyes. J Glaucoma 2012; 21:486–489. Garcia-Porta NG, Fernandes P, Queiros A, Salgado-Borges JS, Parafita-Mato MP, González-Méijome JM. Corneal biomechanical properties in different ocular conditions and new measurement techniques. ISRN Ophthalmol 2014; 2014:19. Vellara HR, Patel DV. Biomechanical properties of the keratoconic cornea: a review. Clin Exp Optom 2015; 98:31–38. Fontes BM, Ambrósio R Jr, Jardim D, Velarde GC, Nosé W. Corneal biomechanical metrics and anterior segment parameters in mild keratoconus. Ophthalmology 2010; 117:673–679. Shah S, Laiquzzaman M, Bhojwani R, Mantry S, Cunliffe I. Assessment of the biomechanical properties of the cornea with the ocular response analyzer in normal and keratoconic eyes. Invest Ophthalmol Vis Sci 2007; 48:3026–3031. Nassar MK, Sarhan AE, El-Sawey MF, Alsherbiny AI. Assessment and evaluation of visual acuity, indications, and complications after penetrating keratoplasty. Menoufia Med J 2014; 27:234–238. Kotecha A, Russell AR, Sinapis A, Pourjavan S, Sinapis D, Garway-Heath DF. Biomechanical parameters of the cornea measured with the Ocular Response Analyzer in normal eyes. BMC Ophthalmol 2014; 14:11. Mollan SP Wolffsohn JS Nessim M. Accuracy of Goldmann, ocular response analyser, Pascal and TonoPen XL tonometry in keratoconic and normal eyes. Br J Ophthalmol 2008; 92:1661–1665. Touboul D, Roberts C, Kérautret J, Garra C, Maurice-Tison S, Saubusse E, et al. Correlations between corneal hysteresis, intraocular pressure, and corneal central pachymetry. J Cataract Refract Surg 2008; 34:616–622. Saad A, Lteif Y, Azan E, Gatinel D. Biomechanical properties of keratoconus suspect eyes. Cornea 2010; 51:2813–3326. Liu J, He X, Pan X, Roberts CJ. Ultrasonic model and system for measurement of corneal biomechanical properties and validation on phantoms. J Biomech 2007; 40:1177–1182. Shah S, Laiquzzaman M, Cunliffe I, Mantry S. The use of the Reichert ocular response analyser to establish the relationship between ocular hysteresis, corneal resistance factor and central corneal thickness in normal eyes. Cont Lens Anterior Eye 2006; 29:257–262.